Social media is key to every content marketer’s distribution plans. But the harsh reality is that just posting your own content on your social media pages often isn’t sufficient to gain the visibility, traction and engagement you need in the never-ending stream of more personally relevant information. Rather you need to optimize your content marketing based on the platform where you distribute it. This means more than just publishing the same content at the same time across networks. 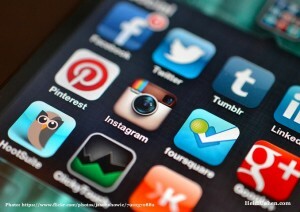 You also have to consider the 5 social sharing powerhouses. What better way to maximize your content marketing social shares than to understand how the 1 million most-shared articles from the top 190 media entities generated results in the first 6 months of 2014. Fortunately, BuzzSumo and Frac.tl joined forces to answer this question. They analyzed over 2.6 billion shares in total across Facebook, Google+, LinkedIn, Pinterest and Twitter. To bring these numbers down to a more manageable magnitude, the average article analyzed yielded 2.6 thousand shares. Don’t stress at this number! While most content marketers salivate to have 1 such article, understand that 93% of publishers in the study received less than 5,000 shares per article. 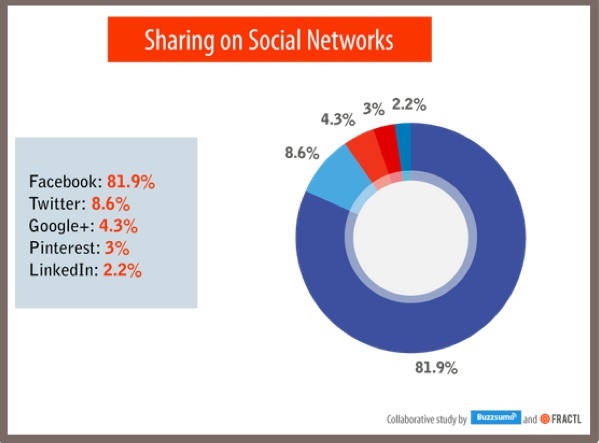 Facebook had 81.9% of all the shares in the study, over 4 times the amount of all the other networks combined. But it’s important for marketers to remember that it’s a multi-purpose social media entity where personal and professional can blur. Therefore, it’s reasonable that social shares were disproportionately high for Facebook because it has a big advantage in terms of size and mindshare. Yet Twitter had a significantly higher proportion of social shares compared to its size while LinkedIn had a significantly lower proportion of shares relative to its size. The surprise was Google+, a social media entity that many marketers overlook, yet its shares exceeded Pinterest and LinkedIn. Although Upworthy and ViralNova never ranked in the Top 20 for any specific social media network, they garnered over 60,000 shares per article or about 5 times Buzzfeed’s rate. Based on other research, this may be attributable to their work and focus on headlines, a factor that every content marketer can improve. While many marketers use a variety of social media platforms to diversify their content distribution, the BuzzSumo-Fract.il analysis revealed that no top media entity used all 5 social media networks. In fact, the top performers tended to focus on a single platform to significantly increased social media shares. 6 of the top 20 publishers obtained over 90% of their social media shares from a single social media network. Upworthy and ViralNova received more than 99% of their total shares from Facebook. Further, BuzzSumo-Fract.il assessed the sentiment of the most-shared articles on each network on a range of positive to negative. Twitter and Google+ revealed the most balanced range of sentiments in their 500 most-shared articles. LinkedIn and Pinterest tended to be positive in the stories shared by their audiences. Incorporate surprise and curiosity into your headlines. This dominated the top 10 performing articles regardless of topic or content format rather than a specific emotion because the top 500 articles published by the top 20 media entities covered a range of emotions. Upworthy spends over 50% of their time optimizing their titles. This is a critical factor for original content as well as curated content. Of course, many content marketers may not be able to dedicate this amount of resources to this effort. While the BuzzSumo-Fract.il analysis is useful to provide direction for social media distribution of your content marketing, understand that many of the top publishers focus on optimizing their content to consistently attract a social media audience. The bottom line for optimizing social media reach is to understand the nuances that your audience seeks on each social media platform. Then tailor your topics, stories and emotions based on the platform you publish. What have your social media distribution results been? 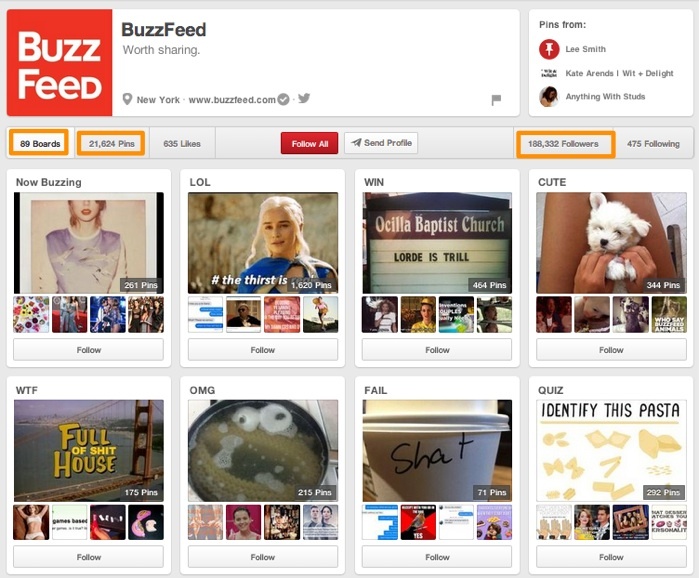 Tags BuzzFeed, BuzzSumo, Charts, Frac.tl, Research, Upworthy. Bookmark the permalink. Interesting stuff Heidi. I have often considered that it would be worthwhile to focus more on particular social networks and I guess this validates that! Wow, what an excellent overview of social sharing! I definitely appreciate this information. In my own personal observations between Twitter and LinkedIn, I have seen more sharing and engagement on Twitter than LinkedIn, so I agree with your “Twitter had a significantly higher proportion of social shares compared to its size while LinkedIn had a significantly lower proportion of shares relative to its size” statement. I’m curious, because of Facebook’s size and there targeting capabilities, do you think businesses need to be on Facebook first then think about the other social media networks?